The fourth and final book in a veterinary equine anatomy guide series written and developed by Auburn College of Veterinary Medicine faculty members is now published and available for use. Titled “Equine Anatomy Guide: Thorax, Abdomen and Pelvis. An Illustrated Guide,” the book is authored by Dr. Mahmoud Mansour, professor in the Department of Anatomy, Physiology and Pharmacology, who is also coordinator of the large animal gross anatomy section. Contributors include Dr. Janet Steiss, professor emerita; Dr. Dewey “Ray” Wilhite, coordinator for the gross anatomy laboratory; and Dr. Paul Rumph, professor emeritus. The series is available as individual volumes or as a complete set at www.blurb.com/bookstore. The guides are available in veterinary libraries worldwide. Dr. Mansour hopes the equine books will become the new standard of equine anatomy guides. Previous guides being used offered only black and white illustrations and lack color and actual photographs of dissected anatomy, according to Dr. Mansour. Additionally, he says that they provide too much details that could not be covered in the time allotted for large animal anatomy. The first three books in the series covered the forelimb, hind limb and head and neck. This final guide on the body cavities contains more than 150 illustrations in 116 pages. It is a dissection guide for veterinary students, but will also be helpful to others who are interested in equine anatomy, says Dr. Mansour. It contains full-color photography images and line drawings to enhance the student’s understanding and improve the guide’s effectiveness as a teaching and learning resource. 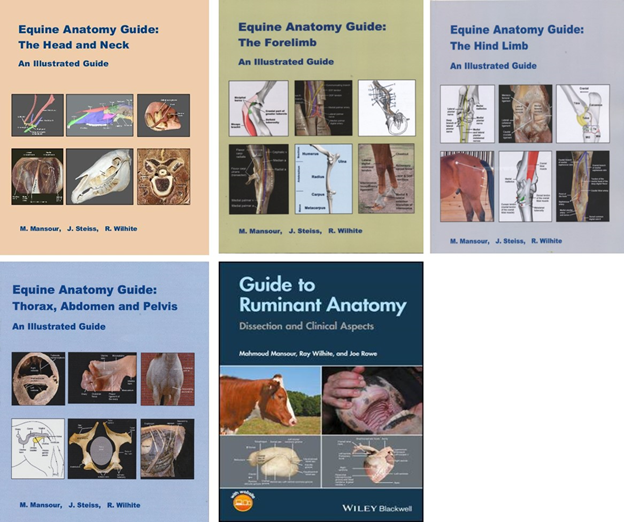 Other titles in the series by the same authors include: “Equine Anatomy Guide: The Head and Neck”; “Equine Anatomy Guide: The Hind Limb”; and “Equine Anatomy Guide: The Forelimb”. Several veterinarians contributed to the equine guide development process, including Dr. Carol Akers of Junction, Texas, for photographs on the teeth; and Drs. Fred Caldwell and Aime Johnson, equine clinical associate professors at Auburn College of Veterinary Medicine for endoscopy images; and retired AU veterinary faculty member Dr. Phillip Garrett, for the line drawings in the books plus additional illustrations of the teeth. Another title, “Guide to Ruminant Anatomy: Dissection and Clinical Aspects,” is authored by Drs. Mansour, Wilhite and Rowe. This volume is published by John Wiley & Sons Inc. and is available through Amazon. This guide is particularly designed for first-year veterinary students who are learning ruminant anatomy for the first time, says Dr. Mansour.